Having a BBQ? Try this interesting grilled appetizer for your guests. 1. Prepare charcoal grill to medium-high heat and coat the gill pan with extra virgin olive oil over high heat using a paper towel. If you are using a grill basket allow to heat for 10 minutes prior to use. 2. Snap ends of asparagus and trim beans and set aside. 3. Grill the bread over direct heat until grill marks appear, about one minute per side. 4. In a bowl lightly toss bell peppers, chilies and onions in olive oil. 5. Place over grill on in grill basket turning and rotating for 6 to 7 minutes for the onions and continue to char the red peppers. 7. Grill tomatoes and when cooled enough remove skin also. 8. Using a food processor add peppers, chilies, onion, tomato along with nuts, thyme and paprika and salt into a thick puree. Drizzle in olive oil as you go. 9. 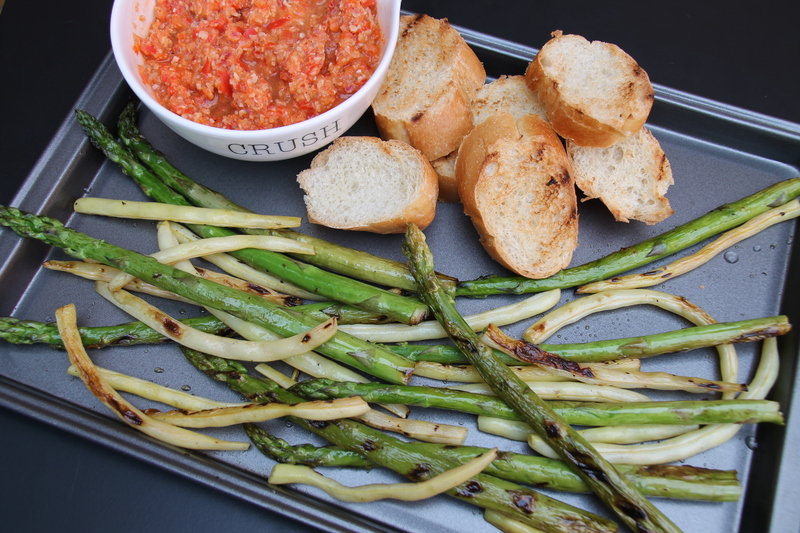 Grill asparagus and beans and serve warm or at room temperature with romesco. •	Sprinkle some flaky finishing salt and serve. This recipes was super simple and very easy to complete. The only thing here is you have to be a fan of romesco. I had heard of romesco before; but never had tried or made it. It reminds me of a salsa or pesto of sorts. Typically it is served with meat or fish; but today it’s served with grilled veggies and totally works. I added some finishing salt and it really rounded out the taste of the veggies.